Your upcoming movie Then What Happens - in a few words, what's it going to be about? The storyline is about an Israeli up-and-coming dancer who loses her ability to dance. We meet her after the fact. 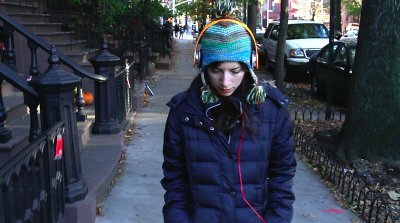 She can�t go back to how things were, but is not ready to �move on� either, so she finds herself in Brooklyn with the goal of buying herself time. We join her during that period, where she gets to explore who she is without her story, without her circumstances. What were your sources of inspiration when writing Then What Happens? And is any of the film autobiographical, actually? Human connection, films and music, places and time... struggles and pain. This is a story about being brave enough to let go before you can see the other side. I�ve lived through such an experience, as I�m sure we all do at different intersections in our lives. Life is a strange thing. It seems that you need to learn to let many parts of you die, before you trust that circumstances can never rob you of who you essentially are. And sometimes it�s a good conversation and even mentorship. In the process of writing the script, Ido Angel, an amazing Israeli writer who I hope you�ll get to be able to read some day, gave me valuable feedback that helped me concentrate on what�s important and let go of caging preconceptions about writing. It�s not an exchange of knowledge or skills, but when something is said in a certain way at a certain time, it can change everything in a second. And there�s no end to this process, of course. From what I know, your film will put an emphasis on dancing and Origami folding - why these forms of artistic expression, and how do you go about bringing them to the screen? Mia's choice of Origami is random. It doesn�t mean anything to her and doesn�t exist in her world of values as dance did, for example, and that�s why it appeals to her. But what�s interesting and subtle about Origami is that the model you see � as complex as it might be � is not the truth or the core of the object; it�s just one of many possible expressions of that piece of paper, just as being a dancer is of that woman. Particularly in Origami, you rarely cut or glue or manipulate the paper in any way � you take its basic features as a given and work with them. When it comes to people, it�s harder to respect that boundary. You'll also appear in front of the camera in Then What Happens, right? So what can you tell us about your character, what will you draw upon to bring her to life, and have you written her with yourself in mind? Yes. I write characters that I want to play. Inevitably Mia and I have a lot in common. The main element is a very turbulent inner life within a seemingly peaceful exterior. It�s not so much that I wrote �her� with myself in mind; it�s that I used myself, my worldview, my sensitivities, and allowed them to be expressed through another personality and different circumstances. What can you tell us about the rest of your projected key cast and crew, and why exactly these people? Stacey Maltin, producer: She is also talented writer and actress, and just recently wrapped her feature Landing Up, directed by Dani Tenenbaum. Steven Latta, cinematographer: I met him through NY-based French filmmaker Estelle Artus, and immediately fell in love with his eye, attention to detail and understanding of text. Lucas Rainey, castmember: We�ve worked together before in front of the camera, and his fluidity and craft blew me away. I wrote one of the characters with him in mind. Michi Kanno, castmember: We met at Taro�s Origami in Park Slope, where I hung out quite a lot over the past two years as part of my research. She is an Origami instructor, and I offered her the same role in my film. She was perfect for it. Justin West, music: I came across his work in mysterious ways (one of the roles in the film has the same name), and adored his music. He agreed to collaborate and allow me to use his song Cold Coffee in the film. You are still running a fundraiser for Then What Happens, right? So what can you tell us about your campaign? 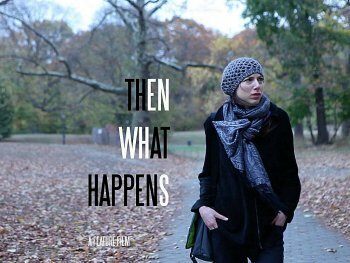 thenwhathappens - is on IndieGoGo and will run through mid October. What we raise will enable us to shoot the film, as planned, this December. Pre-production is already underway, and we are looking forward to making it. What I enjoy about the campaign and the way it�s set is that I get to offer meaningful perks to supporters and to keep in touch with them through the process. So it�s not just about raising funds; it�s about building a community of people who care about and share similar passions. Any future projects beyond Then What Happens? There is a comedy series in the oven, and a meta-style side project in development. I�m also looking forward to seeing an (outlined) improvisation-based film by Wes Ciesla I was cast for as lead role earlier this year, which is currently in post-production. Our IndieGoGo Page - http://igg.me/at/thenwhathappens - has it all, with links to other sites as well. You covered all the essentials. Thanks!